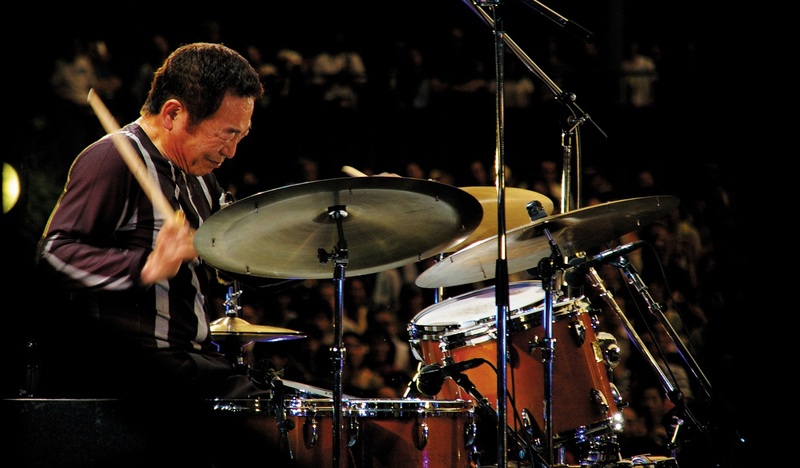 Takeo Moriyama is an acclaimed 73-year-old Jazz drummer, composer, and musician hailing from Katsunuma, Yamanashi Prefecture, Japan. Moriyama started working as a Japanese Jazz (commonly known as "J-Jazz") drummer during the 1960's, released at least four solo albums between 1981-91, and has appeared within countless albums as part of numerous J-Jazz ensembles and retrospective compilations. Takeo Moriyama has lent his air-tight talents, over the years to groups, such as: Aki Takase Trio, Akira Sakata Trio, Miyazawa Akira Quartet, Brötzmann, Satoh, Moriyama: The Heavyweights, Yosuke Yamashita Trio, and his own Moriyama Takeo Percussion Ensemble & Takeo Moriyama Quartet; in addition to albums credited to Manfred Schoof, Akira Sakata, Yosuke Yamashita & Takeo Moriyama, Takehiro Honda, Nobuyoshi Ino & Takeo Moriyama, Mal Waldron & Takeo Moriyama, Shibuya Takeshi + Moriyama Takeo, and Takehiro Honda, Nobuyoshi Ino & Takeo Moriyama as recently as 2002. Earlier this year, London-based label BBE Music issued a wildly successful compilation called J​-​Jazz: Deep Modern Jazz from Japan 1969​-​1984, as curated by J-Jazz aficionados Mike Peden & Tony Higgins. BBE's vinyl-only edition of J-Jazz, actually, featured two selections from Takeo Moriyama, who was the only artist to appear twice within the inaugural comp. J​-​Jazz: Deep Modern Jazz from Japan 1969​-​1984 almost immediately and was soon re-pressed and effectively re-stocked at digital and physical retailers world-wide. Then, as part of BBE's newly-minted J Jazz Masterclass Series, Higgins & Peden oversaw the proper re-release of Tohru Aizawa Quartet's first and only album, 1975's Tachibana Vol. 1. Now, after the undeniable wide-spread success of Takeo Moriyama's "North Wind" & "風 (Kaze)" as included on J​-​Jazz: Deep Modern Jazz from Japan 1969​-​1984, BBE has returned with the second installment of their J Jazz Masterclass Series: Moriyama's East Plants. A bit more of an "under-the-radar set," as described by Tony Higgins, when compared against it's J Jazz Masterclass predecessors, Takeo Moriyama's East Plants was originally released on Japanese label Video Audio Project (VAP) in November of 1983. East Plants has become, in the years since its initial release, a widely sought-after collection of truly unique compositions inspired by Avant-Garde Jazz, Post Bop, Contemporary Jazz, and Modal music of the time. Takeo Moriyama assembled a 5-piece ensemble for East Plants, which included bassist Hideaki Mochizuki, percussionist Yoji Sadanari, and tenor/soprano saxophonists Shuichi Enomoto & Toshihiko Inoue with arrangements by Moriyama & Toshihiko Inoue and entirely produced by Genji Sawai. Moriyama's long-time pianist, Fumio Itabashi, was, unfortunately, unable to play on East Plants, as well as its 1982 predecessor, My Dear, and as a result, the album showcases a uniquely sparse sound with just percussion, bass, and reeds, as well as other unorthodox textures. BBE's J Jazz Masterclass Series' mission is fairly simple: "to issue the finest in Japanese Modern Jazz in full re-production artwork with translated original notes, new essays, photos, and OBI strips." Takeo Moriyama's long-lost 1983 VAP album, East Plants, is now available on BBE Music in CD, digital album, and 2xLP vinyl formats, each complete with the aforementioned fully-immersive 2018 re-issue features.